The drilling project at New Zealand’s Alpine Fault is the first to investigate a major fault that is due to rupture in a big earthquake in coming decades. An international team that drilled almost a kilometre deep into New Zealand’s Alpine Fault, which is expected to rupture in a major earthquake in the next decades, has found extremely hot temperatures and high fluid pressures. Our findings, published today in Nature, describe these surprising underground conditions. They have broad implications for understanding what happens in the buildup to a major earthquake, and may represent the discovery of a new type of geothermal energy resource. The Alpine Fault is one of the world’s major plate boundaries and New Zealand’s most hazardous earthquake-generating fault. It runs for 650 kilometres along the spine of New Zealand’s South Island and we know that it ruptures on average every 300 years, producing an earthquake of about magnitude 8. The last time the Alpine Fault did this was in 1717, when it shunted land horizontally by eight metres and uplifted the mountains a couple of metres. It is expected to rupture in a major earthquake in the next few decades and, even though this may not happen in the next 30 years or even 100 years, we know that the fault is at the end of its seismic cycle. Other projects around the world have drilled into major faults, but usually just after a major earthquake. The Deep Fault Drilling Project, which involved more than 100 scientists from 12 countries, gave us an opportunity to take a close look at a fault as it builds up to its next rupture. It is the first time this has ever been done on a major fault that is due to fail in coming decades. 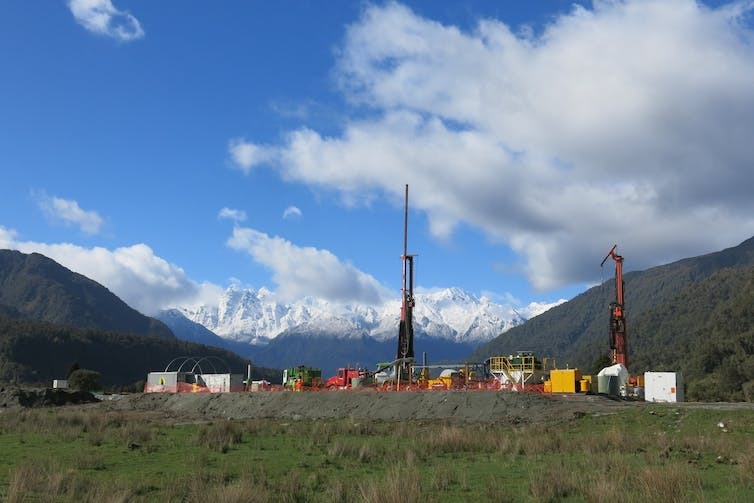 Drilling into New Zealand’s most hazardous fault. We drilled two holes and during our second attempt made it to 893 metres deep. As we drilled deeper, the temperature increased rapidly, at a rate of about 15 degrees Celsius per 100 metres in depth. This is much higher than the normal rate of about 3°C per 100m in depth. At a depth of 630 metres, the water at the bottom of the drill hole was hot enough to boil, if it had been allowed to rise to the surface. The high pressures at depth stop it from boiling. The hottest boreholes on Earth are mostly found in volcanic regions. We discovered a geothermal gradient – a measure of how fast temperature increases with depth – that is similar to the hottest geothermal energy boreholes drilled into volcanoes of the central North Island; but there are no volcanoes near the Alpine Fault. There are two processes we think explain the extreme underground conditions at our drill site. An earthquake on the Alpine Fault has two geological effects: mountains are pushed higher and the shaking breaks up rocks. During an earthquake and over time, the fractured rocks come down in landslides and rivers carry them to the sea. This limits how high the mountains can get. This process has operated for millions of years, with the height of the mountains staying about the same. Eventually, hot rocks from great depth (about 30 kilometres deep, at 550°C) were transported to the surface quickly enough (on geological time scales) that they did not have time to fully cool. Heat is transported from depth by the rock movement. The other process that helps explain our findings is the rock fracturing, which allows rain water and snow melt to percolate downwards into the mountains so fast that it can move heat towards the valley, where water wells up and discharges. The flow needs to be fast enough so that the heat is not lost along the way, just as a water pipe in your home moves heat from a hot water cylinder to your bath before having time to cool. Water flowing through the rock concentrates heat and raises fluid pressure beneath the valleys. The hot, high-pressure water beneath the valleys is mostly invisible at the surface, because it mixes with shallow, cold groundwater that flows to a depth of about 50 metres at our drill site. However, most of the valleys in the region where we drilled have a few warm springs that hint at this deeper source of hot water. The unexpected results of our research are important beyond New Zealand. Other faults around the world that we know are similar to the Alpine Fault may also have extreme conditions that have never been investigated. Perhaps most significantly, we can now describe and estimate conditions on a geological fault that will rupture in an earthquake. This will help us to develop better computer models of earthquake rupture. It may also help us to explain how some types of geology (for example certain types of gold mineralisation) have formed as a result of similar conditions in ancient earthquakes. The extreme underground conditions we discovered may result in substantial economic benefits for New Zealand by providing a sustainable and clean geothermal energy resource that could be used by industry and local communities. We expect that similar hot geothermal conditions exist in other nearby valleys, and maybe in some other places in the world that are geologically similar to western New Zealand. More drilling and measurements are needed to establish the scale of this local resource, its possible uses, and if it is safe to develop. This entry was posted in Earthquake, New Zealand, news and tagged Alpine Fault, article, Earthquake, extreme, fault, fluid, heat, New Zealand, news, pressure, underground. Bookmark the permalink.